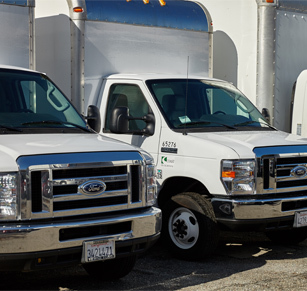 Family owned and operated since 1983, Coast Truck Rental is San Francisco’s largest independently owned truck rental company. Whether household, commercial or special event, car or truck, we can support all of your transportation needs. Coast Truck rental has a dedicated commitment to our customers and our community. We offer clean, well maintained vehicles, and unlike other companies, ours are plain white with room for your own magnetized corporate logo. Our staff is friendly and knowledgeable and will help you to make sure you get the right size truck for your job. We are conveniently located in the Dogpatch neighborhood, with easy access to the freeway and ample customer parking. We are also located just a few blocks from the 23rd St stop on the Muni T line, offer an after hour truck return, and have a secure, indoor space to store your bike. Support local and independent businesses! As members of the San Francisco Local Merchants Alliance , we know that when you spend your hard-earned money here, it stays here, supporting locally owned businesses, city neighborhoods and services, and enhancing the quality of life in San Francisco. There is no reason to go anywhere else for your local truck rental needs. We offer friendly, quick service, clean and reliable vehicles, a convenient location, a no hassle rental procedure, and rates that more than compete with the big guys. Coast Truck Rental also rents cars through our Rent A Wreck franchise! Coast Truck is a locally owned and family operated independent truck rental that has been serving San Francisco since 1983. Owner Tom Pendergast has been working in the rental industry in San Francisco since 1967, first with Jack Barrett Truck and Auto leasing, then staying on when, in 1973, that company was purchased by Coast Leasing of Los Angeles. When Coast Leasing was breaking up in 1983, Tom took over the San Francisco office and started the independently operated Coast Truck Rental. Starting first at the location at the corner of 8th and Harrison, Tom eventually moved to the current location at 2955 3rd St. In 1994 Tom was joined by his son Matt, and have been running Coast Truck as a family business ever since. In 1995 a Rent A Wreck car rental franchise was added, increasing our rental options to now include cars and passenger vans. It is our goal to take care of all your transportation needs promptly, efficiently, and at a reasonable price. From compact car to 16 foot bobtails, and all types and sizes in between, we can assure a clean, well running vehicle. Copyright © 1983-2019 Coast Truck Rental. All Rights Reserved.